At 10-31-2018 – Click image to enlarge. UPDATE: We received a ruling this morning (Friday, April 22, 2016) that the Court has granted the Injunction to AJB/Surespan to have the road blockade removed. The RCMP can enforce the Injunction Monday, April 25th. While ELF is disappointed in the narrow ruling, we will respect the decision and will not participate in further peaceful resistance against possible road building and logging in the people’s drinking watershed. 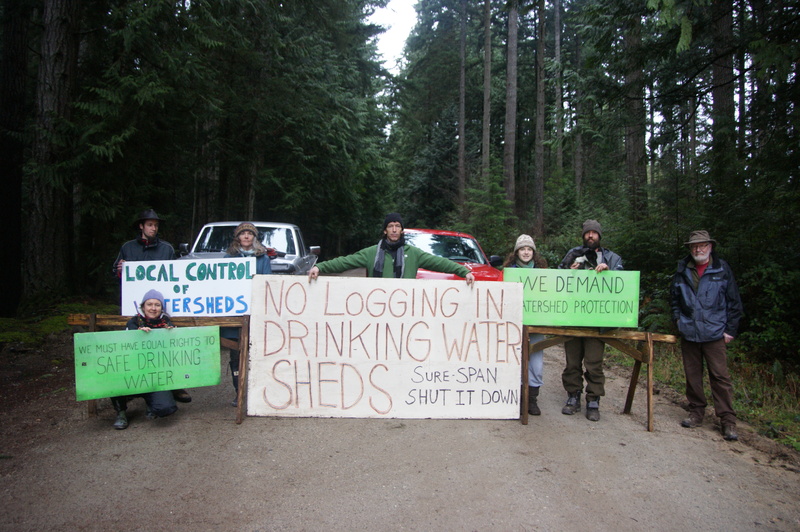 As of Friday, Feb. 12, 2016 a peaceful protest has been erected on a Forest Service Road (FSR) leading into the Chapman Creek Drinking Watershed (above Field Road, off Hwy 101, near Wilson Creek, between Sechelt and Roberts Creek, BC Canada – ‘on the Sunshine Coast’ – Directions below) to prevent clearcut logging from proceeding. Today at 5:30AM a small group of 8 citizens braved heavy rains and winds and set-up a roadblock to stop fallers contracted by Surespan (owners of the AJB Investments that own large private property in the Chapman) from stripping away more of the forests that provide many environmental services to the watershed that supplies drinking water to our communities. Directions: Drive up Field Rd (off Hwy 101), past the SCRD offices, turn Right at the top. Drive .7km to the powerlines, then turn Left. Drive 2.9kms along the Sechelt-Airport FSR until you come to the blockade. This is a peaceful situation and no one will be arrested, as Surespan has not issued an Injunction against the roadblock. The RCMP know of its location, and are okay with it until this issue gets resolved between the parties. 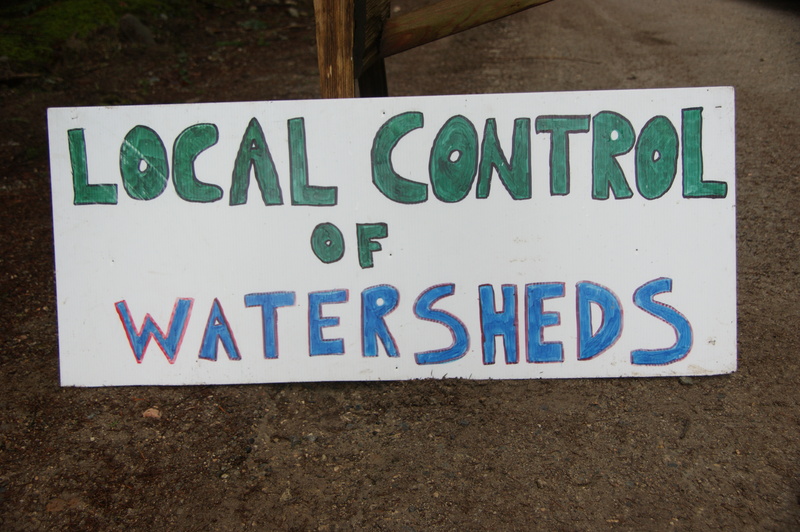 Watershed Management 101: to have a functioning drinking watershed, the first line of defense for clean water is an intact forest & vegetation cover. 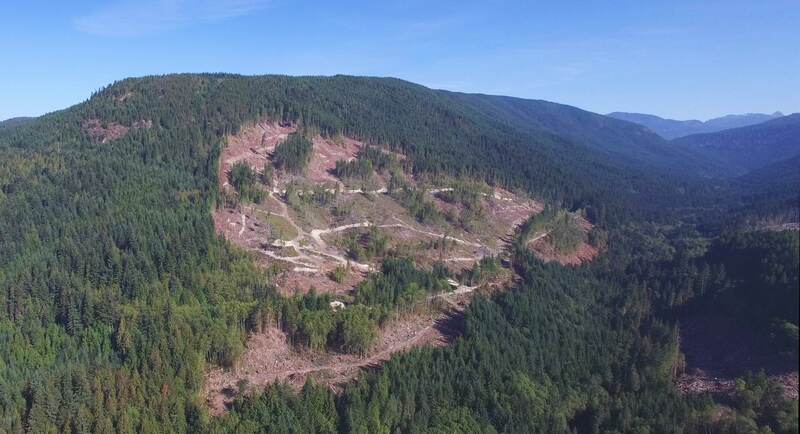 To remove the trees, and expose the soils from logging shows clear negligence. Let’s do something about this. 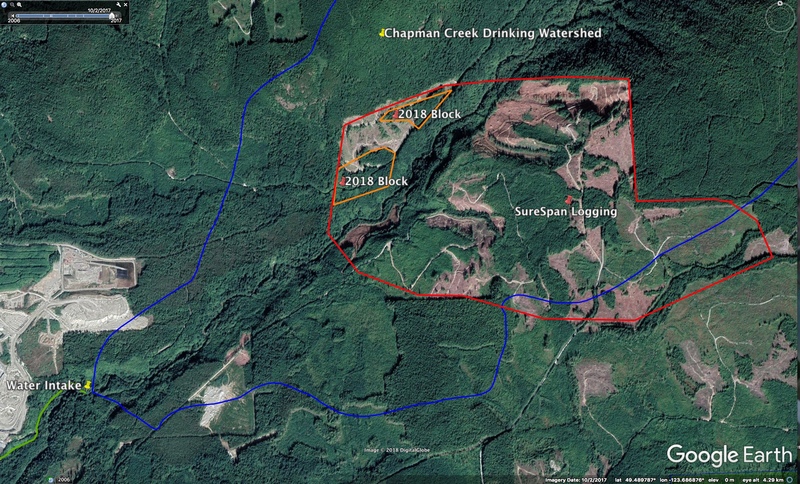 Call your Sunshine Coast Regional District Representative and email the Board demanding that they, along with the shishalh Nation, enter into meaningful discussions with the property owner (Surespan) to arrange a land purchase of their property within the Chapman Watershed. Option B is for the SCRD to seek an Injunction against Surespan to stop logging plans. Surespan’s President Mark Rogers can be contacted at mark@surespan.com, or by phone at 604-998-1133. 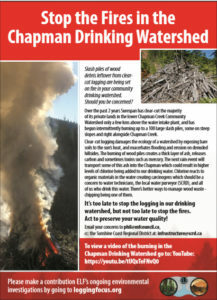 Request that he call off this logging in your drinking watershed. Trees pump water up into their trunks, store that water, then release 99% of it back into the surrounding environment – that’s called Transpiration. Tell Rogers that trees acts as water storage tanks, thus if Surespan trucks away these trees, they’re taking away (stealing) our water too.